TOTAL FLANKER...a rugby blog: Whatever happened to: the Laws of the Game? 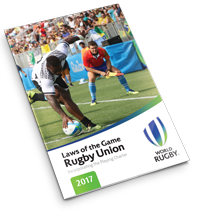 As another new season approaches and my son's team (now Under 15s) drifts back to training, I and the team's other coaches are once again faced with having to understand, and then explain, various changes to the laws of the game that have been introduced by World Rugby ahead of the new season. It seems that every season there is a tweak or several, here or there, to the laws in aid of something or other that no one ever really bothers to explain, it being more a case of "it's a new season, let's make life as difficult as possible for players, coaches and spectators." My recollection (and this may be case of the rose-tinted specs being worn again) is that seasons would come and seasons would go with very little intervention from the powers-that-be. I do recall being somewhat indifferent when the value of a try was changed from 4 to 5 points and I remember being a little confused by the idea that the team driving a maul forward were no longer awarded the subsequent put-in at the scrum. I also recollect being entirely bemused by the concept of a team kicking a penalty into touch and being awarded the throw-in. But that's it. Only three law changes in god knows how many years of me playing rugby through the eighties and into the nineties have actually stuck in my brain. There may well have been more, but they clearly weren't significant enough for me to remember (with the absurd idea of allowing lifting in the lineout being introduced subsequent to my first "retirement"). It's all very different today. World Rugby probably think they are helping to improve the game - and they probably have a department whose raison d'être is simply to keep on churning out these "improvements" - but in reality all this does is to confuse. And if the players and coaches are struggling to keep up, then what chance the general public? Rugby is complex enough without complicating things further. Enough is enough - I say to World Rugby that it is time to stop tinkering, to focus on ensuring existing laws are properly policed and to give the public time and opportunity to understand the game. And to give us poor beleaguered coaches a break!